We waited and waited through Advent. Then we waited with bated breathe for the actual baby to get born on Christmas Eve, or is that actually Christmas morning itself? But . . . nothing of moment happens until the “royals” arrive, and they, as “royals” do, take a very long time traversing, crisscrossing, the desert sands on camels to evade the watchful eye of a jealous ruler named Herod. Rumors have alerted them and they are curious to see if there really is a new “king” who will bring peace and good will and replace the politics of the tyrant Herod. That’s the ancient story. That story is not old! There is no better idea than replacing our current politics—the whole fraught mess of it. May we rise above partisanship. It’s not working for either party. I don’t know what a politics of Love would look like exactly, and perhaps it’s not humanly possible except in small ways in big hearts. The “royals” were not kings but wise men/Magi from the far east. 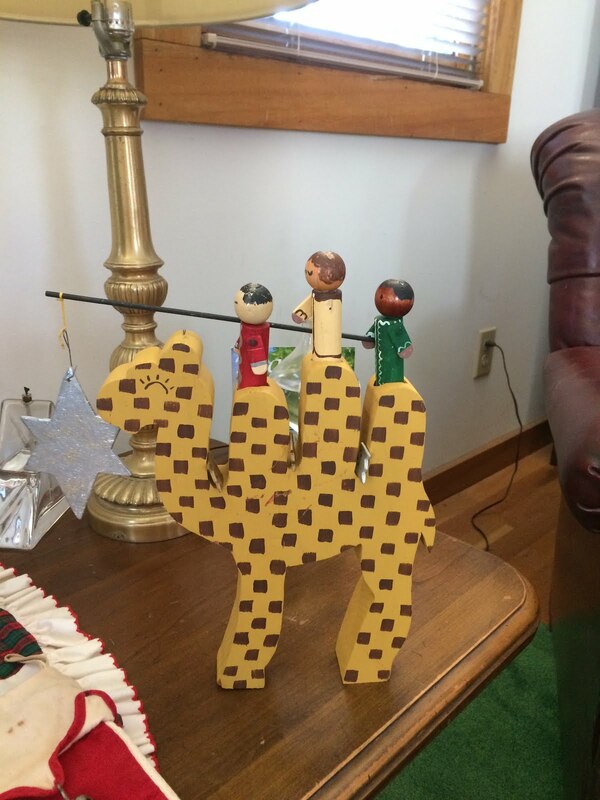 In our house, in ancient story, and in many cultures, they don’t make it to the creche until Epiphany. We don’t fully celebrate Christmas until three guys arrive—El Dia de los Tres Reyes, January 6th. Our Magi have just arrived—a bit disheveled—one Asian, one black, one female, all without their crowns. They must have lost them on the way. If you look closely you can see the fallen crowns tucked in between the camels' one-too-many humps. I consider this an extremely good omen: no crowns, no kings, no emperors, no almighty display. Just a group of hopefuls following an out-sized star no less. Welcome these crownless dethroned worshipers. They’re exhausted; they still bring gifts; they still brandish Hope—in the most royally defiant way.